On its opening day, the Habitat III Conference welcomed 30,000 people, of which 25,000 attended the different events at the Casa de la Cultura. The Habitat III Exhibition, located at the National Assembly, registered an attendance record of 7,000 people. 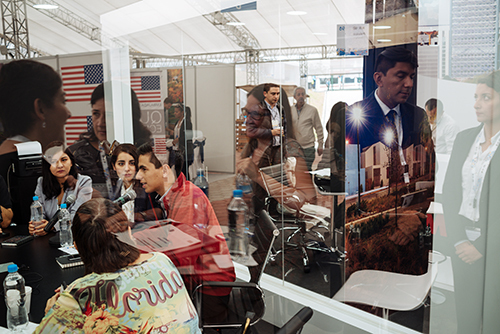 Of the 25,000 accredited, more than 8,700 people had travelled to Quito and more 13,700 national participants flocked through the gates of the Parque del Arbolito, representing a strong and wide range of global stakeholders from national delegations, local authorities, and civil society to business and industry. The Habitat III venue has turned into a small city with 5,000 service personnel. Such high turnout is a testimony to the strong interest in the conference, in the relevance of the themes it addresses, and in taking part in the global conversation about our cities. It signals the Habitat III Conference as a global arena where stakeholders, national and international, can ensure that their voice resonates in the discussions on the implementation of the New Urban Agenda.